Time after time over the past years I’ve been asked “Do you have a book of your pictures” and until now, the answer has always had to be negative, because the only books I’ve produced have been single copy ‘artists books’. One or two were made as ‘book dummies’ to try and sell the idea to a publisher, but although I might have had the occasional appreciative grunt (and even an offer to publish if I could come up with a large grant) I’ve never found anyone who felt it could be worthwhile as a commercial proposition. Of course, as we all know, publishing on demand has changed that, and anyone can produce a book and make it available without a great initial outlay. In the past few years I’ve seen a number of such volumes produced by photographer friends, but certainly with black and white, always found the quality a little (sometimes more than a little) disappointing. Apart from a few specialised and very high price services the technology didn’t seem quite there. But a few months ago I saw a book that changed my thinking about this, and decided me it was time to try it for myself. 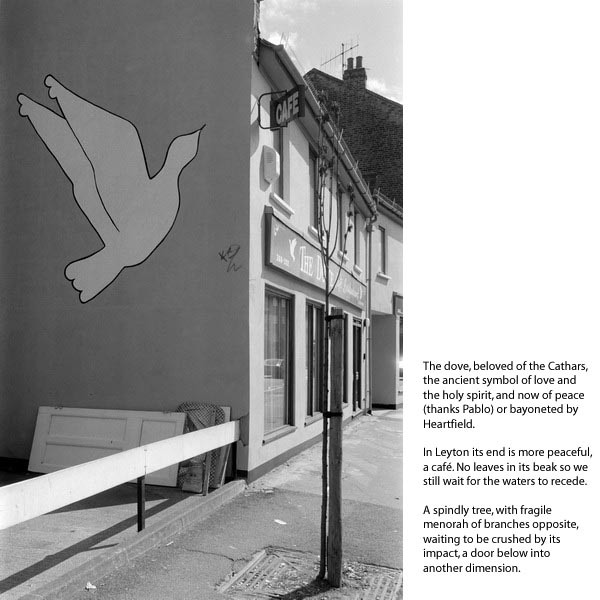 A few days ago I finally received a hardback and a softcover copy of my work ‘1989’, twenty photographs taken in north-east London in (would you believe) 1989 and first put together for the web with my own text in 2005-6. I’ve now had time to revise it and it is now on-line and on sale at Blurb. You can actually still see the whole project on the web, and the book follows this fairly closely with a few minor revisions to the text I made (mainly typos) for its recent showing at the London International Film Festival. I’m pretty pleased with the printing which is on Blurb’s recently introduced ‘premium’ lustre paper. I’d say print quality is adequate rather than excellent, and certainly better than many published books, but not of course at the standard of better (and often highly subsidised) publications using duotone, tritone or quadtone printing. The hardback is a nicer volume, although the print quality in both is very similar as they both use the same premium paper and lustre finish. It also comes with a dust-cover which includes a picture of me, which may put some off! You do really need to have a different cover design for the two versions, and so far as I can see, with Blurb you can only get that by publishing hardback and softcover as two different books. There are a few minor things where I wasn’t quite able to get Blurb’s Booksmart software to do exactly what I wanted. It does make the design easy – and allows you to produce your own customised page designs, as I did, but there are a few inflexible elements. You can submit your books as PDFs instead, but the software I have for this doesn’t give the required file type. I’m still thinking about setting up my own “press”, buying a block of ISBNs and bringing out this volume under that imprint, together with around ten other projects I have more or less ready, along with others I’m working on. And a couple of friends are also interested in becoming a part of this publishing process. For that it might be worth buying a copy of Adobe Indesign, for which Blurb supply templates, but I’m not yet convinced that Blurb is the right answer for this yet, partly because it does add significantly to the cost of Blurb books to remove their logo and message and replace it with your own, but also because there is an unresolved problem which does not allow the normal placement of ISBN bar codes. As well as seeing the entire set of images on the web, you can also look through a part of the published book on the Blurb web site. And of course order it from there. This entry was posted on Monday, May 17th, 2010 at 02:27 pm and is filed under My Own Work, Photo Issues. You can follow any responses to this entry through the RSS 2.0 feed. You can leave a response, or trackback from your own site.